Laura Hunt, an image, fashion, and beauty consultant at Freeway Fashion, says you should always ask what to wear if you’re invited to an event with an unfamiliar dress code. 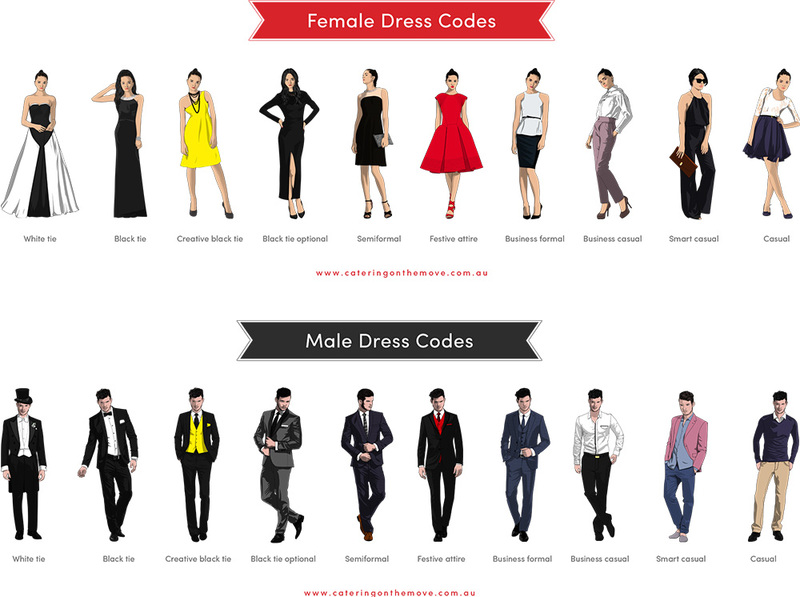 Hunt and Tannya Bernadette, a wardrobe stylist and 2009 Fashion Marketing graduate from The Art Institute of Seattle, decode what to wear for the following dress codes. Women: Wear a pencil skirt or dress pants, paired with a silk or button-down top and high heels. Men: Opt for dressy trousers, paired with a collared shirt and loafers. When to wear it: office parties, happy hours, business luncheons. Women: Avoid wearing denim, tennis shoes, and cotton tees. Instead, opt for silk pants, dress pants, or a skirt. Pair with a patent leather flat, or one with nice embellishments such as a bow, buckle, or a print. Men: Wear trousers and a dress shirt with a leather loafer, oxfords, or a slip-on shoe. Pair with a blazer or sport coat. Avoid showing up with wrinkles or clothes one size too big, too small, or in a non-coordinating color. A tie is optional. When to wear it: church, dinner, or an invite received via phone or e-mail. Women: Choose an open-necked or polo shirt. You can also opt for dresses and skirts with minimal accessories. Men: Wear an open-necked or polo shirt, paired with khakis. Accessorize with leather shoes and a belt. When to wear it: cruise lines, the country club, friend’s home for dinner, nice restaurant. Women: Put on a skirt, khakis, or dress pants paired with long sleeve or three-quarter sleeve tops. A casual dress and flats are options as well. Men: Wear a button-down or a polo shirt, paired with khakis, or dress pants. If you so desire, layer with a v-neck sweater, a blazer, or a sport coat. A tie is optional. When to wear it: company party, daily work attire, business lunch meetings. Women: Wear a shorter dress with some frill. The classic little black dress makes for great cocktail attire, and is the easiest to show your personality by accessorizing to suit your mood. Men: Wear a dark suit, coat, and tie. Opting for dark jeans paired with a jacket and tie is also acceptable at some cocktail events, depending on how casual the atmosphere is. When to wear it: adult birthday parties, evening social events. Women: Wear a dress that would be appropriate for brunch or afternoon tea. It should fall to, or slightly above, the knee, and not be too sparkly or low-cut. Incorporate a jacket or shawl to cover the arms. Men: Opt for a dark suit, paired with a French-cuffed, crisp white shirt. You can go with or without a tie. Opting for a vest instead of a tie adds to the informality of the look. When to wear it: daytime engagement parties, business breakfasts, afternoon tea. Women: A floor-length ball gown is a must. Accessorize with opera length gloves, glamorous jewels, and up-do hairstyles. Men: Wear a short or waist length black tailcoat (tails should reach the back of your knees,) white bow tie, starched white shirt, and a cummerbund (optional). Sport high-quality black pants. When to wear it: charity fundraisers, government ceremonies, weddings, the opera. Women: Gussy up in a floor-length ball gown. A very dressy cocktail dress may be acceptable depending on the venue of the event. Men: Wear a dark suit or a tuxedo without tails. Pair with a white shirt and a tie, or a bow tie with or without a vest and a cummerbund. When to wear it: charity fundraisers, political dinner parties, weddings. Women: Dress up in a long gown, cocktail dress, or snazzy separates. Accessorize with the latest trends, such as feathers, sequins, sheer fabrics, and capes. Show off your personality with every detail. Men: Incorporate trendy prints in with your tie and a dressy shirt. Mix fabrics such as a silk blazer and a dress shirt to create a formal, yet interesting, look. When to wear it: galas, silent auctions, weddings, and formal dinners that have a fun atmosphere. Women: Wear a long gown with white gloves and minimal jewelry. dress shirt, bow tie, a cummerbund, and nice black leather shoes. When to wear it: formal events that are held outdoors, such as a cruise line or country club dinners, weddings, and galas. Women: Look glamorous in a long gown, cocktail dress, or luxurious separates. Accessorize with items such as long gloves, clutches, and jewelry to top off the whole look. Men: If you own a tuxedo, put it on. If not, wear a suit in a dark color such as charcoal or black, paired with a white dress shirt, and a solid colored tie. Make sure patterns are kept to a minimum and shoes are shined. Accessorize your look with a pocket square and cuff links. When to wear it: elegant events such as galas, silent auctions, weddings, formal dinners.